Outfielder Leon Culberson played for parts of six seasons in the major leagues, starting in the World War II years, but though he only got into 371 games (and five World Series games), he had two standout moments. The first was hitting for the cycle on July 3, 1943. The second was fielding Harry "The Hat" Walker's fly ball late in Game Seven of the 1946 World Series; he recorded the putout, but on the play, the Cardinals scored the run that won them the Series. He played American Legion ball in Rome in 1934, two years in high school, then semipro ball for three years in Shannon, Georgia, and one year with a company team. Culberson tells how he was first signed. "I was playing with a semipro club in Rome, Ga., and some representatives of the Kannapolis club came through Rome looking for a third baseman. I was then playing third and was recommended by one 'Slick' Moulton, former University of Auburn All-American. They talked to me and I decided to start into Pro. ball. "3 It meant quitting Georgia Tech, but he was ready to give it a try. Culberson was right-handed, listed at 5-feet-11 and 180 pounds. Kannapolis was a cotton-mill town; the team was named the Towelers. Culberson played for them in 1940, appearing in 68 games and batting .307. He hit 14 homers in the Class-D North Carolina State League. Boston Red Sox scout Bunn Hearn spotted and acquired him.4 In December, Culberson married Willie Katherine Brandon, a stenographer. A daughter, Gloria Kay, was born in 1941. Another year at Scranton saw him rebound to .286 over 120 games in 1942, albeit with just one home run. Scranton missed first place by one game, but beat Binghamton handily in the Eastern League playoffs. In the offseasons, Culberson had worked on the farm, but in the winter of 1942-43, he worked for Brighton Mills, manufacturing rayon. Culberson's debut was on May 16, in the second game of a doubleheader at Comiskey Park against the White Sox. He was 2-for-5 at the plate, with a single and a double. Defensively, he wasn't charged with an error but there was a ball another fielder might have caught. In the second inning, White Sox catcher Tommy Turner hit a fly ball to deep center field. "Culberson did not accurately gauge the force of the wind and the ball fell safely for three bases, in back of him as he finally raced back. "8 The triple wasn't costly, though, since the White Sox tried a squeeze play on the next at-bat, but the batter, pitcher Johnny Humphries, missed the ball entirely and Turner was out in a rundown. He had a pair of two-RBI games and was hitting .250 when he suffered a serious ankle sprain on May 31, keeping him out of the lineup for a couple of weeks. On June 23 his fourth-inning solo home run into the left-field stands off Don Black beat the Athletics, 1-0, at Shibe Park. It was the July 3 game in Cleveland which bumped him up to batting an even .300, thanks to a leadoff single in the first inning, a double in the top of the third, and a triple in the sixth, all off Chubby Dean, and then a leadoff inside-the park home run in the eighth off reliever Mike Naymick. Left-fielder Pat Seerey had the ball tick off his glove on the home run, but he couldn't corral it and Culberson rounded the bases. All four hits were to left field, and the IPHR went an estimated 400-410 feet. Rogers Birtwell of the Boston Globe said he had crossed home plate before the ball got back to the infield.9 His homer broke a 2-2 tie. It was a "natural cycle," hitting them in that order. He was walked in the ninth. The Red Sox won the game, 12-4. As of the end of the 2015 season, there have only been 14 "natural cycles" in major-league baseball history. In a July 5 doubleheader, Culberson was 6-for-10, his highlight hit being a bases-loaded triple. Hitting .323 by day's end, he had reached his high for the year; his average tail off to .272 in 81 games by the end of the season (52 in center and 27 in left). A collision at first base caused a knee injury which prevented him from playing in September. He finished with 34 runs batted in. In 1944 he almost exclusively played center. He got in a similar number of games (75) but saw his average drop to .238, with 21 RBIs. Culberson played throughout the war years, rejected on more than one occasion as physically unfit for duty; he had a trick knee which had incapacitated him twice during the 1944 season. Again, he missed most of September in '44. Culberson's most active year was 1945, with 45 RBIs in 97 games and a .275 batting average. And he helped turn a league-leading six double plays as a center fielder. With Ted Williams back in left field and Dominic DiMaggio back in center, Culberson was relegated more to a backup role in the pennant-winning year, 1946, playing more right field than anywhere else, and even appearing in four games at third base. He hit for a .313 batting average in 59 games and drove in 18 runs. His most dramatic hit was a grand slam hit on the first pitch he saw from Tex Shirley in the bottom of the 14th inning of the May 7 game against St. Louis. He would have played more but for an injury in May and a pulled muscle in mid-July that cost him more than a month. He won another pair of games in September with a single in the 10th inning of the September 1 game and an 11th-inning single on September 21. 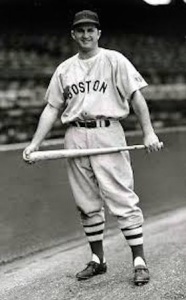 In the 1946 World Series, Culberson was 2-for-7, one of the hits a solo home run halfway up into Fenway Park's left-field screen off Al Brazle in Game Five leading off the sixth inning, giving the Sox an insurance run in a game that had been just 2-1 in Boston's favor. After seven innings in Game Seven, the Cardinals were ahead, 3-1. Rip Russell singled to lead off the top of the eighth and pinch-hitter George Metkovich doubled. Harry Brecheen was brought in to pitch for St. Louis and got both Wally Moses and Johnny Pesky out without anyone scoring. Then Dom DiMaggio doubled, driving in the two baserunners and tying the score. Unfortunately, DiMaggio pulled a hamstring trying to leg the double into a triple. He had to come out of the game. Joe Cronin put Culberson in to run for him, and to play center field in place of DiMaggio. Culberson played in 47 games in 1947, pinch-hitting more than anything else, but batting for the same .238 average he had achieved in 1944, and drove in 11 runs. He was traded to the Senators in December for Stan Spence; the Sox threw in minor-leaguer Al Kozar. Culberson appeared in just a dozen ballgames for Washington (hitting .172) before he was traded to the Yankees (designated for their Kansas City club) for Bud Stewart. The Senators sent $20,000 along, too. Culberson made headlines in July when Milwaukee Brewers catcher Frank Kerr missed a pitch and the ball stuck in umpire Harry King’s mask – but still in play. Culberson saw what happened and stole second. After a couple of more years in the minors, Culberson finally hung up his spikes. He did play once more in Yankee Stadium, though -- for the 1946 Red Sox, who beat the 1947 Yankees in a “Not-So-Old-Timers” game on August 9, 1948. Five Red Sox pitchers combined on a no-hitter (it was a two-inning game). In 1949, Culberson was on the rosters of two International League teams -- the Yankees farm team in Newark and then, after a sale in the first part of August, the New York Giants team in Jersey City. He hit a combined .237 in 124 games. There was some talk that he was considering taking up professional golf. He did play some competitive golf well into the 1960s. In 1950 he was in the Boston Braves system and played in 21 games for Double-A Atlanta (batting .224 before being released) and 93 games at Class-C Baton Rouge (.296). Three years of managing followed, first in 1951 for the Georgia-Alabama League team in his hometown, the Rome Red Sox. In 1952 he managed two different teams for a portion of the season, first for the Middlesboro Athletics in Middlesboro, Kentucky, then for the Rock Hill Chiefs in the South Carolina community. None of the three teams had winning records. In early 1953 he was named business manager of the Greensboro Patriots, recommended for the job at the Red Sox affiliate by Sox farm director Johnny Murphy.11 He resigned in mid-June. After baseball, Culberson worked as a specialist in production control for General Electric, a 32-year G.E. employee, retiring in 1983 after 32 years. He officiated high school basketball and football in the area for 12 years. His grandson, Charlie Culberson, born in Rome in April 1989, played in 146 games for the Giants and Rockies in the years 2012 through 2015. In addition to the sources noted in this biography, the author also accessed Culberson's player file and player questionnaire from the National Baseball Hall of Fame, the Encyclopedia of Minor League Baseball, Retrosheet.org, Baseball-Reference.com, Bill Lee's The Baseball Necrology, and the SABR Minor Leagues Database, accessed online at Baseball-Reference.com. 1 Burt Whitman, "Hose Win, Need One More," Boston Herald, October 12, 1946: 7. 2 American League player questionnaire, in Culberson's player file at the National Baseball Hall of Fame library. 3 Handwritten note on United States Navy stationery in Culberson's player file. 4 Burt Whitman. "Weather Halts Sox; Culberson in Bow Today," Boston Herald, May 16, 1943: 88. 5 Chic Feldman. "Rambler Culberson Reaches Red Sox on Speed and Spirit," The Sporting News, March 27, 1943: 7. 6 Associated Press. "Greensboro to Get Pitcher Norm Brown," Greensboro Daily News, May 17, 1941: 5. 7 Associated Press. "Red Sox Get Culberson," New York Times, May 17, 1943: 18. 8 Burt Whitman. "Lucier Wins in Sox Debut, 4-2; Culberson Also Stars as Hose Split at Chicago," Boston Herald, May 17, 1943: 11. 9 Rogers Birtwell. "Culberson Gets Four Hits for Total of Ten," Boston Globe, July 4, 1943: B8. 10 Author interview with Bob Broeg, March 26, 2001. 11 "Ex-Boston Red Sox Outfielder New Pat Business Manager," Greensboro Record, January 19, 1953: 20. 12 "Culberson Called Up, Makes Major League Debut," May 13, 2012, at http://m.giants.mlb.com/news/article/31157686/. Accessed November 5, 2015.